Jon Springer: Peatos bypassed the natural food channel and went direct to traditional retailers such as Albertsons and Kroger. How and why did this happen? Nick Desai: The natural channel is not so natural anymore. Pricing pressures and consolidation among distributors, as well as a lack of transparency, have caused the natural channel leaders to resemble the big retailers and alienated their core small-brand clientele. Meanwhile, the big conventional retailers have shifted their mindset to attract millennials seeking challenger brands. We found a very friendly and supportive launch partner for Peatos in Kroger. Given that they sell six times the groceries nationally of Whole Foods, and they were willing to really get behind a younger brand, it was an easy choice for us. To what extent have traditional retailers’ receptiveness to new brands softened, in your opinion? I would say things have shifted dramatically. What would have been unheard of years ago is now very real. More forward-minded traditional retailers are seeking out and coddling younger innovative brands and challengers. They want to attract the new generation of consumers and millennials, and well-managed retailers like Kroger and Walmart are really shifting their mindset. Others are catching up or struggling. Natural retailers have made it easy by losing some of the “touchy-feely” elements that historically made them great launch partners for new brands. Would debuting in Kroger and Albertsons have even been possible a few years ago? It would have been much more difficult. Brands used to have to develop as a “child” in the natural channel so they could graduate to the “adulthood” of the conventional world. That is so different now. Bear in mind this doesn’t apply to all retailers; we have found certain retailers to be more progressive than others. Kroger and Walmart are doing particularly good jobs at this, in our view. When we chose Kroger to become our national launch partner for one of the most innovative snacks to hit the market in decades, we did not take the decision lightly. Do you have a preference whether your products are merchandised in produce departments or with snacks? Yes. We are a produce-centric brand. Plant-protein snacks belong in produce and, candidly, this is a huge opportunity for the produce department. Plant protein was proclaimed one of the hottest tech trends by Google leader Eric Schmidt. Proteins are merchandised in the perimeter of the store. Millennials shop in the produce section and have the highest level of interest in plant proteins. It all points to produce as the place where these types of snacks should be merchandised. We have other product lines in development that may include “fresh” components. What are pulses, anyway? And what do consumers need to know about them? Pulses are the edible seeds of leguminous plants. Commonly known pulses are beans, peas and lentils, but there are so many pulses virtually unknown in the West. They are an amazing source of plant protein and fiber and other key nutrients like iron, zinc and folates. Pulses are a primary source of protein in some countries like India. 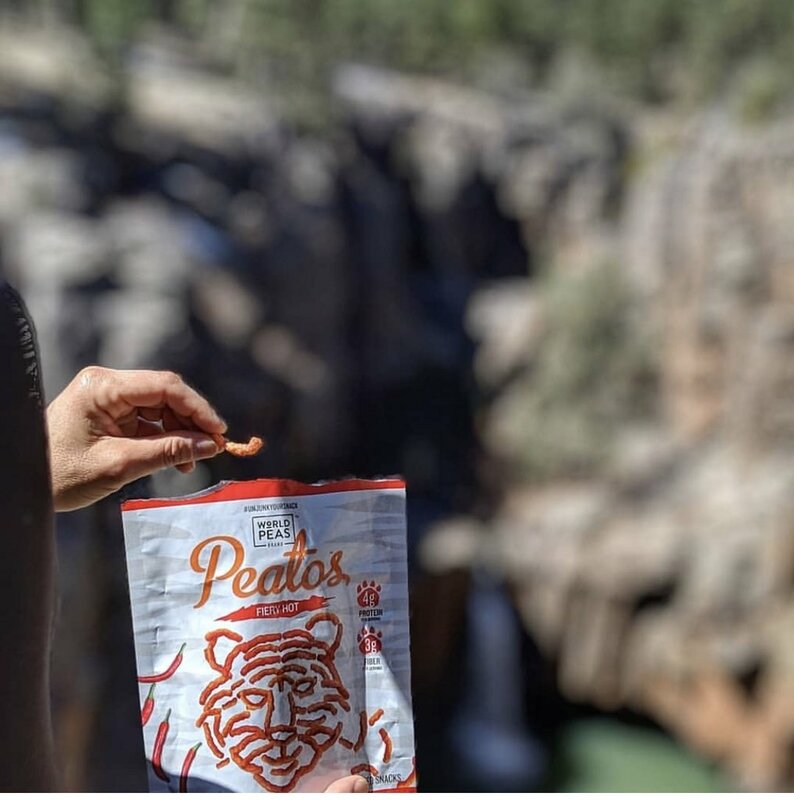 Peatos are a crunchy, puffed snack made with a combination of pulses—beans, peas, chickpeas and lentils—that contains 4 grams of protein and 3 grams of fiber per serving. You’ve made no secret of the mainstream CPG competitor consumers should compare Peatos to, and appear to be replicating the taste, texture and appearance of. Have you heard anything from the Cheetah? We have a great admiration for the Cheetah. Used to be one of my favorite snacks when I was younger. But like the T. rex, the corny Cheetah failed to evolve and adapt, and therefore may face extinction. What unhealthy habits have you yet to break? McDonald’s French fries. Eating late at night. What’s the best piece of business advice you’ve gotten? Who does the food shopping for your family? My wife, at Costco, Walmart, Ralphs and Trader Joe’s. Outside of your own brands, what “healthy takes” on traditional products do you admire? Beyond Meat burgers, Love Grown Foods cereals.